W Debate: Who is the better athlete, Bonnie Blair or Kerri Walsh Jennings-Misty May-Treanor? 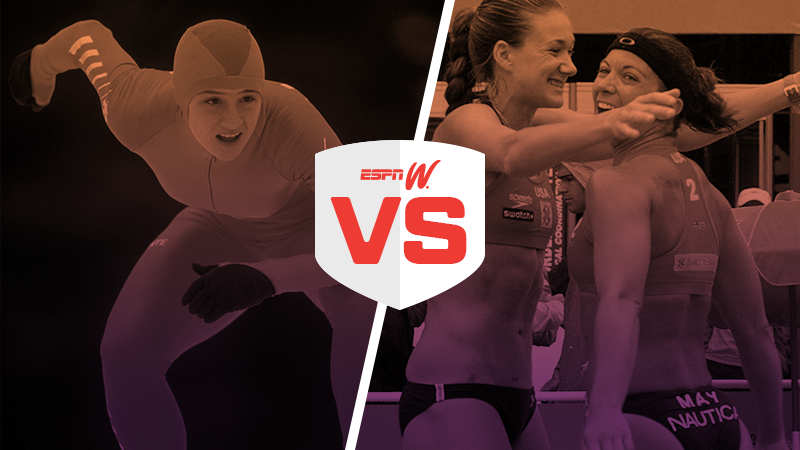 Bracket Challenge Round 1: Bonnie Blair or Kerri Walsh Jennings and Misty May-Treanor? The case for Bonnie Blair starts with this: She is the most decorated female Winter Olympian in U.S. history. No American woman can top the five Olympic gold medals or the six overall medals Blair won in speedskating from 1988-1994. Blair's dominance started at the 1988 Winter Games in Calgary, where she set a world record in the 500 meters and also won bronze in the 1,000 meters. The Cornwall, New York, native followed that up four years later by winning both the 500 and the 1,000 -- becoming the first American woman ever to win an event in consecutive Winter Olympics, and the first American athlete overall to do it since 1952. In 1994, Blair made it three golds in a row in the 500 (after no one had ever won even two in a row in the event before) and also repeated as champion in the 1,000, where her margin of victory was the largest in Olympic history for the event. "Her long strides make her the best technician in the world over the sprint distance, man or woman," U.S. coach Peter Mueller told ESPN. Blair left on top. On the day she turned 31, in 1995, Blair set an American record in the 1,000 and then hung up her golden skates. Kerri Walsh Jennings was physical, tall and powerful, loud and extroverted, an intimidating blocker and the best offensive player in volleyball. Misty May-Treanor was finesse, small and fast, quiet and focused, an outstanding setter and the game's best defender. Together, the two opposites combined to make the best beach volleyball team of all time. Walsh Jennings and May-Treanor went 21-0 in the Olympics, losing just one set total while winning three straight gold medals in 2004, 2008 and 2012. They also won 112 matches in a row, 19 consecutive tournaments and three straight FIVB world championships (in 2005, 2007 and 2009). Both had athletic parents -- Margie Walsh was a volleyball MVP at Santa Clara University, and Bob May was a member of the 1968 U.S. men's national volleyball team. Both had illustrious college careers -- May-Treanor won the NCAA Female Athlete of the Year award when Long Beach State went undefeated in 1998 and won the national title, while Walsh Jennings won two national titles at Stanford and was the second volleyball player to be a four-time first-team All-American (1996-99). Both left the 2000 Olympics short of the medal stand (Walsh Jennings finished fourth with the U.S. team in indoor volleyball, and May-Treanor placed fifth on the beach with partner Holly McPeak). Thanks to their combined efforts, it was a feeling of disappointment they would not know again at the Olympics. During the next three Games, Walsh Jennings and May-Treanor became two of the most beloved and recognized athletes in America.